I recently visited Total Wine in Daytona. It's the only store in Florida I have found to carry a pretty decent selection of brews. Savannah has a number of great breweries making some great products. But for your barrel aged stuff you pretty much have to venture out of town. I was able to pick up some Cigar City Marshal Zhukov Vanilla Hazelnut and a few other pretty decent ales. 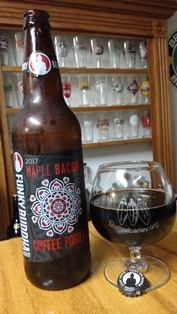 One of which was Funky Buddha - Maple Bacon Coffee Porter which seems to garner some popularity. It poured with a very yummy coffee aroma, not unlike chocolate covered coffee beans. It poured very dark, with a minimal head. Medium bodied, I thought it might have a tannin bite like some lighter porters, but it didn't. Overall I thought it was very good. Not excessively thick like most barrel aged stouts and porters, but very good. At 6.4% the bomber does not put you over the edge, and overall the flavor profile changes little as it warms. While I was at it - I fixed my website. The backend was getting a bit old, the search engine had ceased functioning, and it was time for an update. January 2016 is the previous archive.